Winter weddings are an increasingly popular choice for tying the knot. With the magic of Christmas looming, and the possibility of snowfall on icy landscapes, the special day has an extra element of excitement. Contrary to popular belief, having your wedding in the winter months doesn’t limit your floral possibilities. 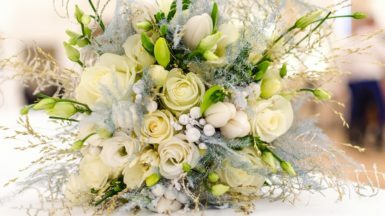 Whether you are having a festive theme, or the classic white wedding, we are sharing some of our favourite seasonal flowers you can add to your special day. This beloved flower only has a short blooming span during the winter months, making it a favourite for the festive season. A small flower, these are an elegant choice for bouquets. The most fragrant of the daffodil family, these little blooms will ensure your wedding day smells sweet. Much like the Narcissus Paper White, the Amaryllis is famous for being in season during the winter months. However, this bloom provides a more choice in terms of colour. Add a pop of vibrant orange, or keep it seasonal with rich burgundies. The Amaryllis also comes in a variety of sizes, so this beautiful bloom can be the central focus of your bouquet or compliment other flowers of your choice. Looking for your something blue? The agapanthus is a popular choice for wedding decorations and bouquets. Found in various shades of blue, choose a softer shade or opt for a deep and vibrant pop of colour. For a wonderful filler to your bouquet, why not add some seasonal berries? Skimmia berries, with their rich red colour, compliment more neutral colours perfectly and adds a small festive touch to the day. The classily beautiful flower that needs little explanation. Available in a range of colours from true red to all the colours of the rainbow, you can tailor it to your day. Although this bloom is readily available all year round, this symbol of love is a popular choice for weddings regardless of season, and therefore must feature on our list!